Birth 1 May 1658 Cambridge, Middlesex Co., Mass. 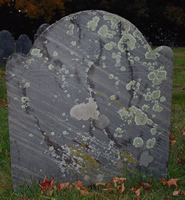 Died Abt 22 May 1714 Lexington, Middlesex Co., Mass. Status: Located. 'Here lyes buried ye body of Samuel Whitmore who died May 22 Ann..Dom... 1714 Aged ...' Growth on the stone prevents reading it. His headstone reads 'Here lyes buried ye body of Samuel Whitmore who died May 22 Ann..Dom... 1714 Aged ...' Growth on the stone prevents reading it.